Advait Rao Palepu and Somesh Jha reports. 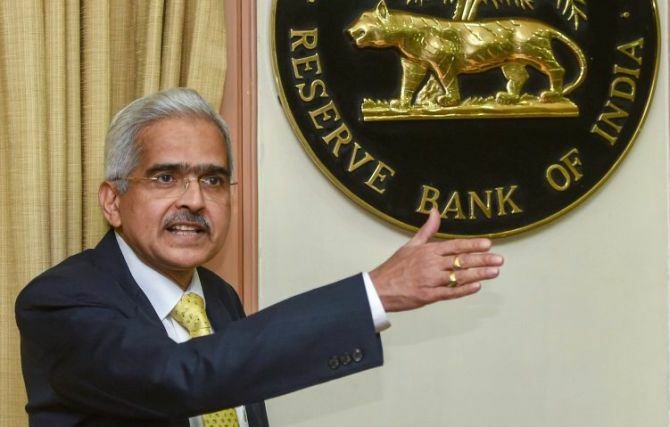 Reserve Bank of India Governor Shaktikanta Das chaired his first board meeting on Friday, discussing issues ranging from governance at the central bank to liquidity in the financial system. The board did not arrive at any decision but held extensive discussions on the governance structure in the RBI and the liquidity situation of non-banking financial companies -- two key areas of concern flagged by the finance ministry recently, sources said. 'Good meeting of the RBI central board. Wide-ranging issues discussed,' Das tweeted. On the governance framework, the board decided it would require further examination, according to the RBI's statement. There was no discussion on the prompt corrective action framework, which the government had asked the RBI to consider revising and bring some public sector banks out of it, sources said. The Board for Financial Supervision, led by the RBI governor, is expected to review the PCA framework at its next meeting. At present, 11 PSBs and one private bank are under the PCA framework and the government feels that it is affecting the credit flow. Two presentations were made by Economic Affairs Secretary Subhash Chandra Garg -- one on the government's proposal for governance reforms in the RBI and the other on the banking system, throwing light upon banks's financials, credit flow and non-performing assets. Financial Services Secretary Rajiv Kumar did not attend the meeting. "Both the government and the central bank will reconcile their notes (on the RBI's governance) and come back to the board in the next meeting. There was no commitment, though, from the new governor on whether governance reforms in the RBI were needed or not," the person cited above said. The RBI issued a statement after the four-hour meeting. 'The board reviewed, inter alia, the current economic situation, global and domestic challenges, matters relating to liquidity and credit delivery to the economy, and issues related to currency management and financial literacy,' it said. The next central board meeting is likely to be held before the Budget in February. According to sources, the RBI's board meeting on Friday was "cordial" as Das got acquainted with various monetary, credit and regulatory issues faced by the economy. It was like a "usual" board meeting, unlike the previous two meetings, held on November 19 and October 24 which saw heated exchanges between the board members on a range of issues flagged by the government, another source said. The last two board meetings went on for eight-nine hours. The liquidity situation of NBFCs was discussed in detail, a board member said, requesting anonymity. "The numbers do not signal any liquidity crisis at present. But we have to be watchful of the situation. The RBI is monitoring the position on a daily basis. A systematic intervention is not needed as such," the person said. The meeting comes days after Dr Urjit Ravindra Patel abruptly resigned as RBI governor amid differences with the government on a range of issues. Das was chosen governor within 24 hours of Dr Patel's resignation. 'The board placed on record its appreciation of the valuable services rendered by Dr Urjit R Patel during his tenure as governor and deputy governor of the bank,' the RBI’s statement said. According to sources, RBI Deputy Governor Dr Viral Acharya, whose speech in October brought to light differences between the government and the RBI, actively participated in the board meeting. "He is here to stay and might as well complete his tenure," a person said. There were speculations that Dr Acharya also might resign, but it was denied by the RBI earlier this week. "His (Das) approach to work seems that of working as a team with ease in communication. Perhaps he benefits from prior experience of representing government on the RBI board while being the DEA secretary," a board member said. During the last meeting on November 19, one of the longest board meetings of the central bank, against the backdrop of the 'war of words' between the RBI and the government, it was decided that the BFS would be responsible for examining the PCA framework. The RBI statement also said that the board discussed the draft report on the 'Trend and Progress of Banking in India' for 2017-2018. Sources said the expert committee to review the RBI's economic capital framework would be notified in the coming days. The panel will be likely chaired by former RBI governor Bimal Jalan.